"It's unique to this country to attempt to destroy our players' morale before a major tournament. It's weird, unpatriotic and sad." 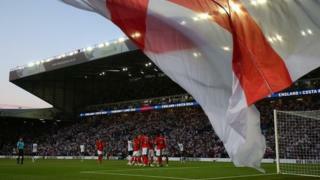 It led to an outpouring of support for the England winger on social media, with some suggesting that England "must be the only country whose players get treated like this by the media" before a World Cup. Image caption Former England international Lineker said the media coverage around Sterling was "unique to this country"
This includes England (1966), the two most recent World Cup winners - Germany (2014) and Spain (2010) - the most successful country in World Cup history, Brazil (1958, 1962, 1970, 1994 and 2002) and England's classic international rival Argentina (1978 and 1986). Reality Check: Does form matter for teams competing in Russia? Does history tell us who will win in Russia? Two media sources were chosen for each country, with journalists noting which articles were positive and which were negative about players selected to play at this year's finals. For every country, between 80% and 85% of articles published were neither positive nor negative - covering transfer news, fitness levels and reports about players' personal lives that were not intrusive. One way of measuring negativity is to investigate the opposite - the absence of positivity. This sort of reaction to an unconvincing victory might explain why more positive articles were published in Spain than anywhere else - but only just. The source of the positivity in the Brazilian media generally stemmed from articles profiling their players' strengths, with UOL Sport calling Brazil right-back Fagner (link in Portuguese) "an example of discipline" and Globo praising Willian for his relationship with coach Tite (link in Portuguese). This comes against a backdrop of great expectation, with Globo summarising that (link in Portuguese) "the Brazilian team is responsible not only for the achievements on the field, but also for the country's success as a nation". Translation: The love of my life and I together for a bit... although visiting for less than 1 day... I love you Lucila Ahumada. So the question becomes whether any other country would criticise a player for an innocent social media post - just as the English media focused on Raheem Sterling's Instagram post showing his tattoo. The footballer was forced to publicly apologise (link in Spanish) for the photograph, which was heavily criticised in the media (link in Spanish) for causing fans to "foam at the mouth" with anger at him posting the photo. The English media was found to be the most negative of the sample of worldwide sources that we looked at, with 9% of the articles deemed critical of particular players, or England's chances at the World Cup. The German media coverage seemed to focus on anger (link in German) at Ilkay Gundogan and Mesut Ozil appearing with Turkish President Recep Tayyip Erdogan, with Die Welt labelling Özil (link in German) "a serious problem". Raheem Sterling continued to dominate headlines in the English media, with one Daily Mail journalist urging him to "stop diving", while The Sun called Sterling a "standout performer" - in an article with the headline "when did Raheem Sterling's dad die?". But the negative coverage in Germany seemed to focus on political issues surrounding two players, whereas the criticism in the English media coverage was more personal. In this way, the English media drew similarities with the Argentine media's criticism of Cristian Ansaldi. World Cup 2018: Does form matter for teams competing in Russia? Expected goals: What are we learning from new metric used on Match of the Day?